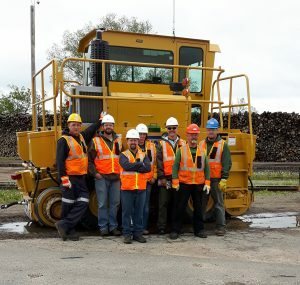 Brandon, Manitoba – Cando Rail Services has won contracts to offer rail switching services at Domtar pulp and paper mills in Rothschild and Nekoosa, Wisconsin. 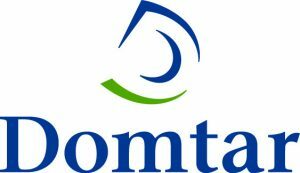 The new contracts build on a successful relationship Cando has established performing the rail switching at Domtar’s Dryden, Ontario mill. Cando was selected in part because of its excellent safety and operational record as a switching provider at multiple locations across North America. Cando moves two million tons of pulp, paper and lumber a year in more than 20,000 railcars. Here’s Cando’s start up crew for Domtar in Rothschild, WI, from left: Mike McNeil (Formet, part of start-up team), Alex Kochanowski (new team member), John Eberhardt (new team member), Trudy Dromson (new team member), Jamie Rolain (new team member), Don Cronk (Resolute / Dryden, part of start-up team), Josh Pellizzari (Assistant Superintendent Northern Ontario, part of start-up team). Cando began operations in Rothschild in early June and will begin at Nekoosa in July. The company will operate two shifts, seven days a week at each location. Long-term goals for each operation include implementing and maintaining industry-leading safety protocols and procedures, and to use Cando’s rail services experience to seek productivity gains. Cando Rail Services is an employee-owned company established in 1978 in Brandon, Manitoba. Cando optimizes the bulk material supply chain for industry and the Class 1 railways across North America. Cando’s goal is to provide a complete rail solution by offering individual services including industrial switching, material handling, logistics, terminal and transload services, engineering and track services, railcar storage, railcar repair and short line operations. Operating at more than 25 sites across Canada and the U.S., Cando serves many industries including automotive/manufacturing, fertilizer/potash, petroleum, grain and grain products, forest products and intermodal. To learn more about Cando’s business and services, please visit: www.candorail.com.